About a week ago, when I asked Josh what he wanted for dessert for his 11th birthday, he immediately answered chocolate mousse. To tell you the truth, I was hoping to make something more challenging, but it was his birthday after all; so chocolate mousse it was. When making chocolate desserts, I usually go by the following guideline: use good chocolate! The types of chocolate that I prefer to use are Valrhona, Scharfenberg, Callebaut or Lindt. Seeing that the dessert I was making was for a eleven-year-old boy, I decided to use a 43% dark chocolate from Lindt. 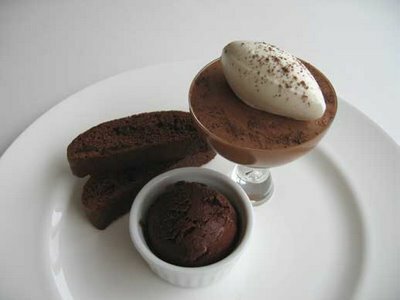 To make the dessert more interesting, I decided to pair it with a chocolate sorbet and double chocolate biscotti. I thought that the chocolate mousse would compliment the intensity of the chocolate sorbet and crunchiness of the chocolate biscotti. The dark chocolate mousse was a standard recipe of mine that I often use. Yet, it was the first time I’d made the chocolate sorbet. The sorbet was intense and would definitely not be to everyone’s liking; only people who appreciate an extremely high cocoa content in their chocolate would appreciate it. The double chocolate biscotti recipe delivered a good chocolate flavour with the right amount of crunch. Having made the three elements and tasting them together, I decided that including the sorbet made the dessert more for a grown up than a child. So I omitted the sorbet and served the mousse with just the double chocolate biscotti. Whip eggs and sugar into a sabayon over a bain-marie. Melt chocolate and add to the sabayon mixture. Whip up cream and fold into chocolate mixture as soon as it has cooled down a little, so that it does not melt the cream instantaneously. Fold in rum or brandy if you are adding. Pour the mousse into glasses, ramekins or a plastic container. If you let it set in a container, you can later, scoop the mousse into a pastry bag and pipe the mousse with a star tip into glasses, bowls, tarts or anything you desire. Place the chocolate in a medium bowl; set aside. Combine the sugar and 2 1/2cups (550 g) water in a medium saucepan. Cook, stirring constantly, until the mixture comes to a boil. Whisk in the cocoa powder and boil for another minute. Pour the hot syrup over the chocolate and whisk until the chocolate is completely melted and the mixture is smooth. Strain through a fine-mesh sieve into a medium bowl. Cool in an ice-bath, then refrigerate until chilled, about 2 hours. Whisk the heavy cream and vanilla into the chocolate mixture. Pour into and ice cream maker and freeze according to the manufacturer’s instructions. Serve immediately or pack into an airtight container and store in the freezer for up to one week. The recipe that I used for my double chocolate biscotti can be found at www. epicurious.com. The original recipe is actually triple-chocolate biscotti that I have made into a double by omitting the white chocolate chips. Posted by Sam at 5:24 p.m.
Miam, this looks a great combination, even for a grown-up! The biscotti and sorbet are a great addition! Beautiful! Thanks for your comment. The dessert actually put me in a chocolate coma last nite! Your B-day has been written down in my planner. The dessert that I would make for you would be sophisticated and whimsical. All your desserts look so beautifully composed - they remind of the ones in Claudia Fleming's book! OMG! Thanks for the lovely comment. I think Claudia Flemming is awesome! Thanks for visiting and adding me to your links. The chocolate sorbet looks divine ... I bet he was one happy camper! Thanks for stopping by! Congrats on your new blog. Josh did enjoy his dessert. Thanks for visiting. Your blog looks great.